In a rapidly changing, increasingly connected world, technology can be a powerful tool not only to enhance, but also to transform learning. Technology can provide opportunities for educators to collaborate and share best practices as well as personalize learning to meet students’ unique needs and interests. It can connect students to high-quality resources and expand access to rich, interactive educational experiences, particularly for students who may be disadvantaged or geographically isolated. Technology makes it possible for teachers to better understand students’ progress, often in real time. And it has the potential to increase equity in education by helping to close long-standing gaps in access to resources and expertise. All students deserve to receive an education that prepares them to succeed in the 21st-century, knowledge-based economy, and all educators must receive the support they need to harness the power of technology to transform teaching and learning. When President Barack Obama entered office, many educators were incorporating technology into their teaching, and nearly every school and library in the country had some level of internet connectivity. But many educators believed they lacked the training to use technology effectively in their classrooms. And many schools did not have the level of connectivity they needed to make use of innovative, technology-based approaches to education. In fact, in a survey by the Federal Communications Commission (FCC) in 2010, nearly half of schools and districts reported they had slower internet speeds than the average American home — and more than half of teachers said unreliable internet access prevented them from effectively using technology as an instructional tool. Rural and tribal communities, where connectivity typically is sluggish and more expensive, were particularly affected. 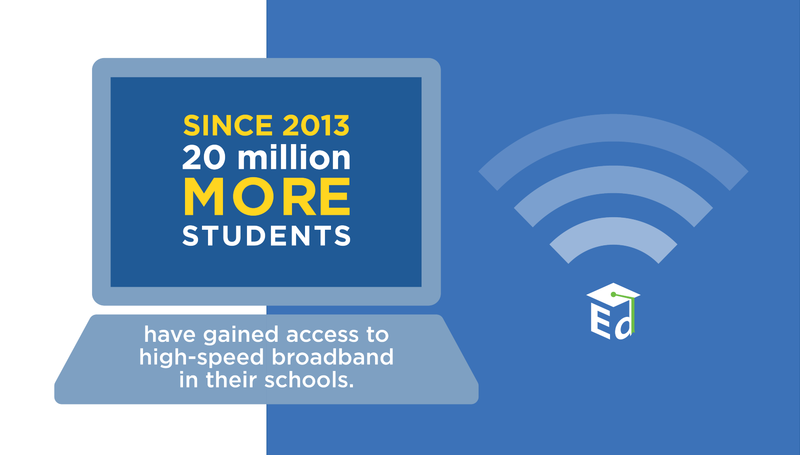 To provide high-speed broadband and wireless to nearly every student in the country and increase the capacity of educators to use technology to advance student outcomes, President Obama called for a bold, five-year effort called ConnectED that has led to dramatic improvements. 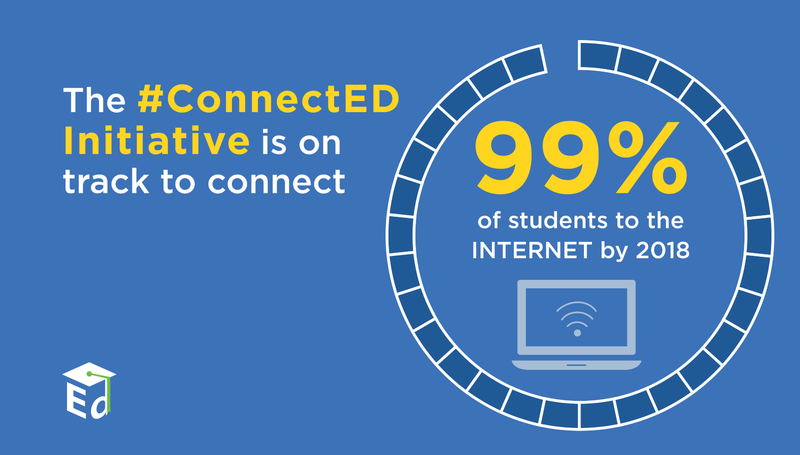 Launched in 2013, the ConnectED initiative set a goal of connecting 99 percent of students to high-speed broadband by the year 2018; called on the private sector and other partners to develop quality, low-cost digital devices and content for teachers and students; and aimed to increase investments in professional development for teachers and school leaders so they can lead the transition to digital learning. 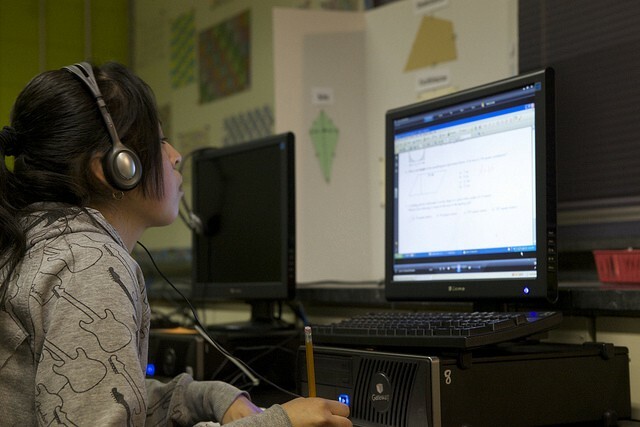 After the President’s call, the FCC modernized E-Rate — the federal government’s largest education technology program — to make billions of dollars available to expand access to high-speed internet services. 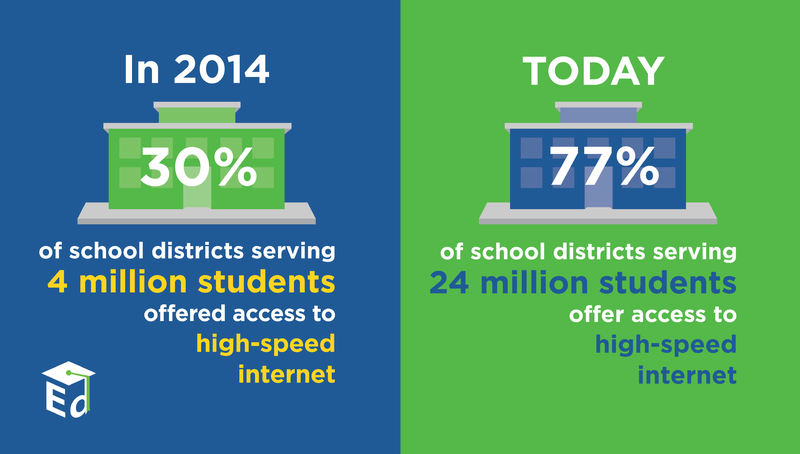 Before E-Rate was modernized, just 30 percent of school districts serving 4 million students offered access to high-speed internet. Today, 77 percent of school districts that serve more than 24 million students do so. Improvements to E-Rate also helped rural and disadvantaged communities build the infrastructure needed to increase their access to broadband. 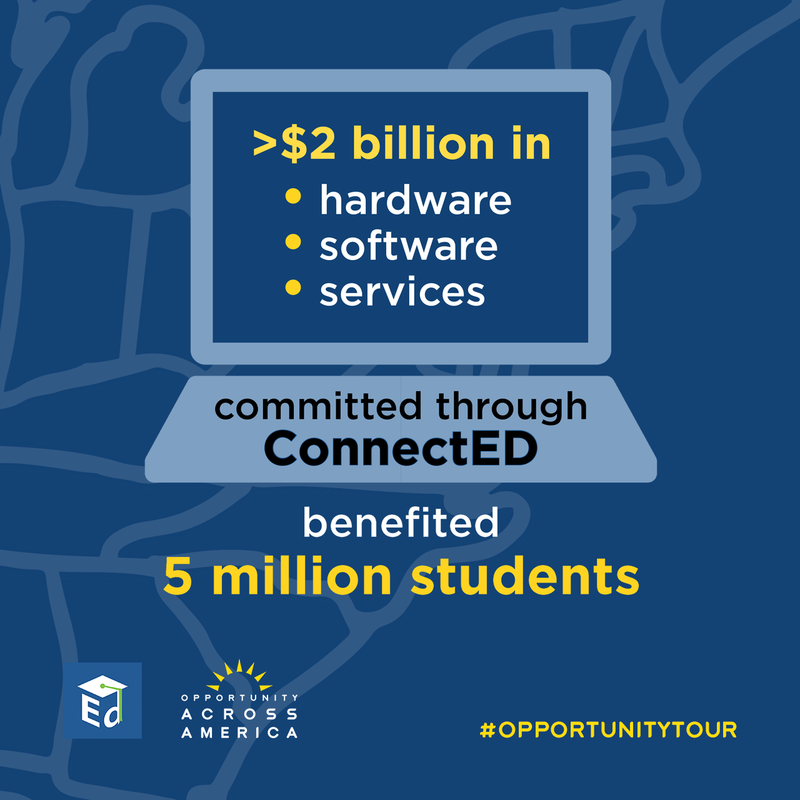 And through ConnectED, private sector companies have committed more than $2 billion in hardware, software, and connectivity services that thousands of schools are now using. This includes $250 million in value from thousands of free, popular eBooks for children in need, due to the Open eBooks initiative. Approximately 5 million students are benefitting from devices, apps, and digital tools provided free of charge by companies that have responded to the President’s challenge. 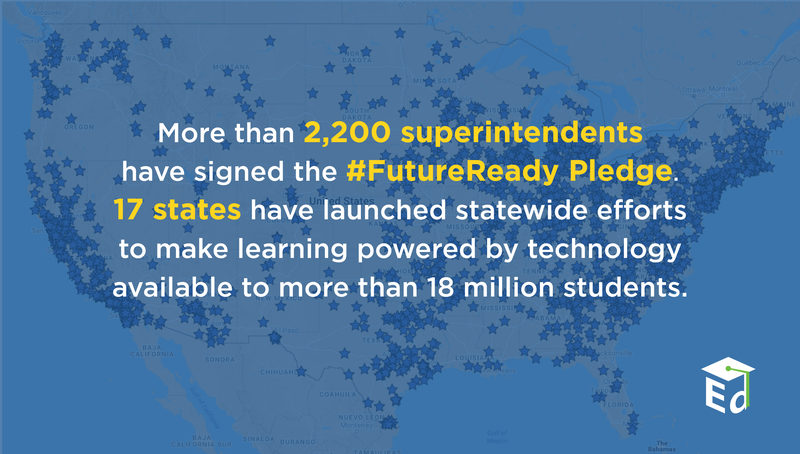 Building on the momentum of ConnectED, the Department of Education established Future Ready — an initiative that empowers local education leaders to drive improvements in the adoption and use of education technology. School superintendents who take the Future Ready Pledge commit to fostering a culture of learning through technology across their schools; offer students greater access to quality digital devices and content; and provide teachers and principals with the support they need to use technology in innovative ways that accelerate student learning. In 2011, the Obama Administration helped launch Digital Promise, a national nonprofit organization focused on driving innovation in educational technology and supporting more than 2 million learners in a League of Innovative Schools. The Administration also created the first federal interagency working group focused on the use of video-game technology for learning and held the first White House Education Game Jam to jump-start the creation of new apps and games that support the needs of students and educators. Since 2015, dozens of school districts and 16 states have committed to using openly licensed educational resources through the Department of Education’s #GoOpen initiative. Open educational resources are publicly available, digital materials and media that can be used for teaching, learning, and research. These resources can increase educational equity by providing students — regardless of zip code — with free access to quality materials that include the most up-to-date content. The nation’s schools play a critical role in communities as hubs for learning and connectivity. So do libraries and homes. With this understanding, the President launched the ConnectED Library Challenge in 2015 — an effort in 85 major cities and rural counties to provide more children with access to digital resources, online collections, and traditional media by giving every child enrolled in school a library card. And ConnectHome, led by the White House and the Department of Housing and Urban Development, has provided low-income families, living in public housing in 28 communities across the country, with low-cost broadband access, devices, and training in digital literacy. New technologies are a force that can lift up all students and their families. The nation must continue its efforts to ensure every child has access to the fast broadband connections and digital learning tools to succeed in school and in life. At the federal level, the Department of Education’s National Education Technology Plan articulates a vision of collaborative leadership for today and tomorrow that can make everywhere, all-the-time learning possible for our students. The Every Student Succeeds Act, signed by President Obama in 2015, also will help educators leverage technology in their work. The law supports educators in using open educational resources, real-time data to personalize student learning, and using technology to increase engagement with families and other educators — all a part of the necessary work to ensure a world-class education for every student in every school.